Most of us are guilty at some point of aggressive driving, sometimes without even realizing it. 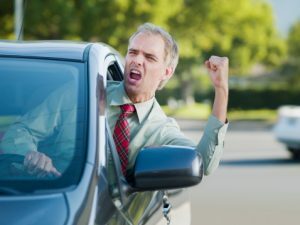 But some drivers allow their anger to get the best of them and take driving aggressively to a whole new level, described colloquially as “road rage”. Road rage can result in shocking levels of violence that sometimes end up splashed across news headlines. Failure to yield or stop for a traffic sign or signal. Our Portland car accident attorneys are committed to fighting for the rights of those who are injured by aggressive drivers, as well as those who take their inappropriate rage out on other innocent motorists. A recent analysis by non-profit journalism outlet The Trace revealed the number of road rage incidents involving a firearm more than doubled in the last three years, totaling 620 incidents in 2016. Over the course of the study period, 354 people were injured and 136 people died in these road rage incidents. Most of these cases appear to be disputes among strangers. It can be difficult to obtain damages in these types of cases, because most auto insurance policies contain exclusions for injuries inflicted by an intentional act of violence, as opposed to an accident. One could still potentially seek damages from the individual, but recovering those damages will depend on the extent of his or her personal assets. Those kinds of incidents are still in the minority in terms of car accidents. Most crashes will be the result of some form of aggressive driving. The AAA Foundation reported that more than 78 percent of drivers admitted to having engaged in at least one of the aggressive driving behaviors examined in the last year. Half had tailgated another driver. Forty-six percent had yelled at another driver, a quarter intentionally blocked another vehicle from changing lanes, and 12 percent intentionally cut off another vehicle. Only about 4 percent exited their vehicle to confront another driver. A significant percentage of drivers say they engaged in these behaviors fairly regularly. The accident caused our client injuries. Oregon is considered a “fault plus PIP” insurance system. It’s a hybrid between the “fault” and “no-fault” auto insurance system. Personal Injury Protection insurance covers a portion of one’s own injuries — up to a certain limit — in the first year after the crash. However, unlike most no-fault states, the law in Oregon doesn’t prevent injured motorists or passengers from filing a lawsuit against another driver before exhausting PIP limits. To get a better understanding of your legal rights after a Portland traffic accident, contact our experienced injury attorneys.